Ideal for: Couples that are looking for an adults-only experience with a luxurious property equipped with a spa and close to a golf course. What I love about the Le Blanc Spa Resort is that it truly has a relaxing nature with its grounds and facilities. From the moment you step onto the property, you will be treated like royalty. You will have plenty of choices for spa packages while other members of your wedding group can go off to the nearby golf course. You can relax on the gorgeous beach, take a dip one of the exceptional pools, or relax in your spacious room. In the evening, you can enjoy entertainment around the resort, or make your way to the Cancun nightlife strip. 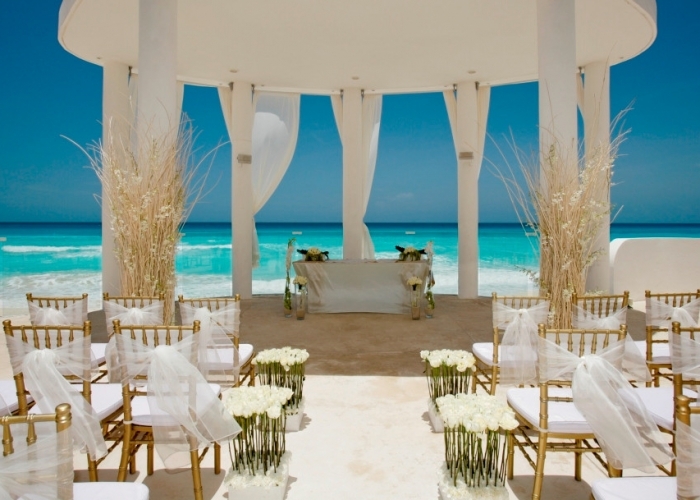 Either way, this resort would be a perfect place for a destination wedding. Furthermore, the resort itself is filled with marble and wood furnishings that will have your wedding feeling elegant. When you are only 30 minutes away from Cancun International Airport, you are close to paradise at the Le Blanc Spa Resort Cancun. Remember that on average, January is the hottest month of the year in Cancun, while September is the wettest. Overall, you are going to have great weather for your trip, and Le Blanc Spa Resort will take care of the rest.